Use this temporary anchorage device as a mobile anchor solution. In just a few seconds, the brass clamps of this anchor, which to a large part is manufactured from aluminium, can be clamped to a steel girder. This device, which only weighs 1.85 kg, protects 1 individual from falling. You can use an ABS-Lock T-Quick to install an overhead system to protect one individual from falling at a moment's notice - all you need is a load-bearing steel girder. This portable anchorage point can be attached to a steel girder using its two girder clamps in just a few minutes. Its low weight makes it the perfect partner for individuals working in industrial surroundings. As it is manufactured from high-quality aluminium material, this anchor weighs less than 2 kg - and people working high-up, industrial climbers & Co. will easily find space for it in their kit. 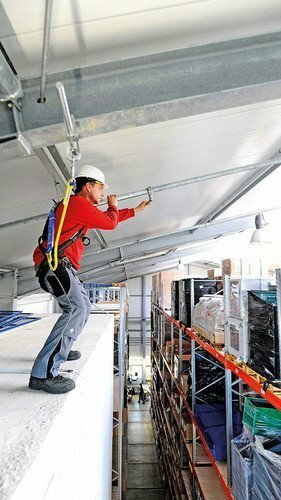 Under the roof of your hall, over a crane way or machinery, in shelf storage areas - in fact, anywhere where your workers are working high up near a precipitous edge, our ABS-Lock T-Quick can be used to provide a reliable anchorage solution to which they can hook up their personal fall protection equipment (PPE). 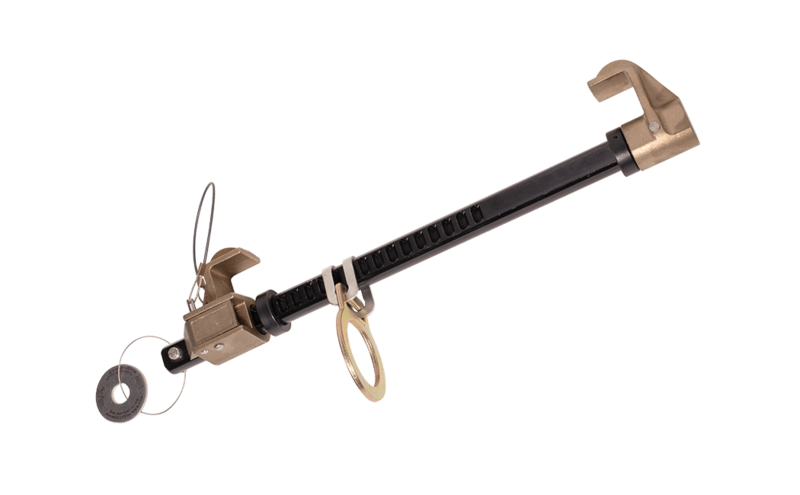 This mobile anchor can be used by one individual as an arresting system by attaching the carabiner hook of his/her lanyard to the anchorage eyelet of the ABS-Lock T-Quick. This lightweight personal anchorage point allows you to set up a so-called cable protection system - should the user fall, the connector between our ABS-Lock T-Quick and the user's harness catches the user, thus preventing fatal injuries which would be caused by hitting the ground. The (lanyard) fall absorber incorporated in the user's PPE equipment ensures that the ensuing force to which the user's body is subjected is prevented from reaching a life-threatening level. Of course, we also offer a full range of components to complete your personal fall protection kit. Our competent Service Team would be pleased to help you to select the most suitable equipment. On the other hand, if you already know what you need, then simply visit our Online Shop and put your equipment together yourself.